I wanted to fry with some tom yam paste but decided not to coz we already had too much of hot spicy stuff the last few days. 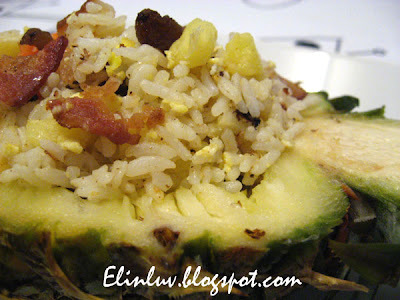 You can consider this as a one dish meal...tasty and easy to prepare for working people like me :))) The tangy pineapple and cajun spice added extra flavor to the Streaky Bacon Fried Rice...yummilicious and appetizing ! Next step , sauteed the garlic in a wok with the bacon oil till fragrant. Add in streaky bacon bits, diced red capsicum and stir fry till well mixed. 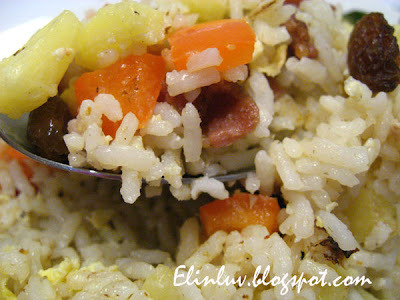 Add in the rice and stir fry till all the ingredients are well mixed. Push the rice aside, add in an egg and push back the rice and cover the egg for a second then toss the rice together with the egg till the egg is cooked and in shreds. Throw in some black raisins if you like . Add 1 heaped teaspoon of salt ( to taste) and 2 teaspoon of cajun spice and a dash of pepper to the fried rice. 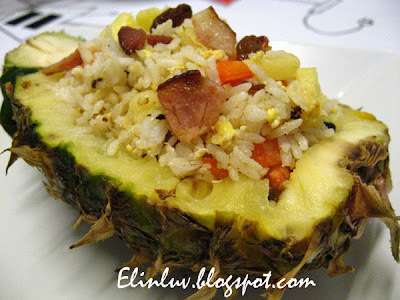 Tossed the rice till well mixed and dish out the fried rice into the pineapple shell . Very unique way to use the bacon! 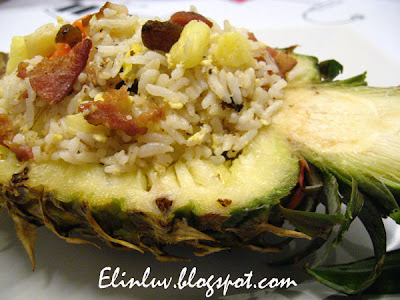 I've never combined bacon and pineapple, but the tart combined with salty and savory flavors sound delicious together!